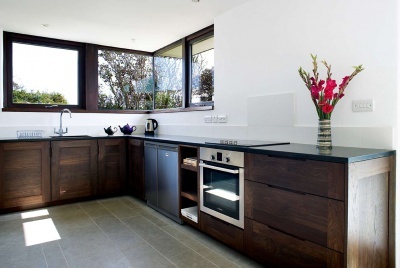 If you are wondering whether a minimalist-inspired contemporary design can provide ultra-low maintenance living suitable for every stage of retirement, look no further. 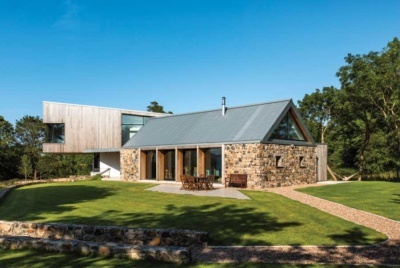 Dorset-based Pennie and Charles Denton have not only created a stunning home for their later years that wowed all of our judges and scooped the title of ‘World’s Most Amazing Home’ in our annual Awards, but meets their requirements for easy living both now and well into the future. The well-travelled couple were holidaying in Italy when the subject of moving from their converted barn (coincidentally, just a few hundred metres from their current home) cropped up. “Of course!” replied Charles — and the project was officially born. The couple jotted down their brief, which found its way to Strom Architects: low-maintenance living; energy efficient; a big space for entertaining; a study each (“Pennie and Charles say it’s the secret of a successful marriage,” laughs Magnus Strom). 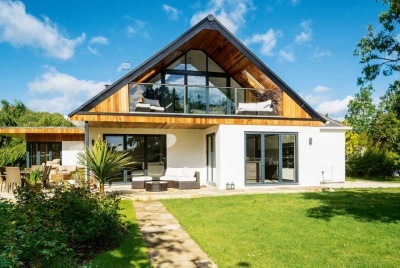 They didn’t specify an architectural style, but after years of living in a period property, and with a love of abstract and modern art, they were attracted to modern light-filled spaces with a good connection to the outdoors. The result, The Quest, is a three bedroom, single-storey house with an internal area of 205m². A large open plan kitchen/dining/living area occupies the centre of the plan, with a covered terrace spanning its length and giving a sheltered outdoor area overlooking the southern views. 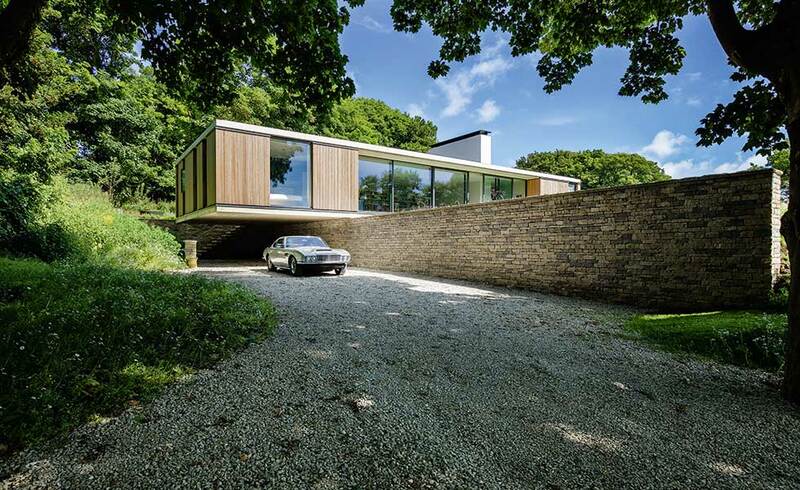 To the eastern end of the house sits the guest accommodation and two studies, with the master suite positioned within the cantilevered western end of the house. Star of the show internally is, without doubt, the open plan kitchen/dining/living area, which is a generous eight metres wide (six metres would be more normal). Construction was straightforward, despite the discovery of a large old stone mine, which needed to be partially infilled and slabbed over before works could begin. There was already a building on the site: a World War I prefab for convalescing soldiers gifted to the UK from the Canadian government. That was quickly demolished, helped along by a complete lack of foundations. Once out of the ground, construction of the exposed waterproof concrete shell, clad with open-jointed larch and insulated internally, could proceed without delay. Sustainability was another important part of the project. 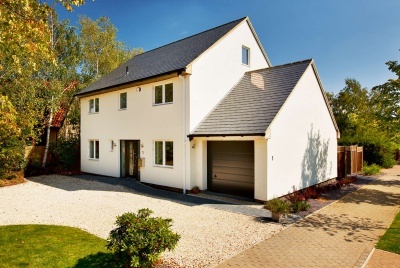 The orientation of the house allows for passive solar gain, while hidden photovoltaic panels on the roof offset the energy used by the air source heat pump situated in the chimney breast — with Feed-in Tariff payments, electricity bills are around £1,000 a year. Overhangs create shading in the summer, removing the need for air conditioning. A large rainwater harvesting tank is buried on site and provides automated irrigation of the gardens — another time-saving device for Pennie and Charles. Architect Magnus is clear about why he thinks this house is so successful: “It’s very easy to understand the house — you kind of see it and you get it. It’s not complicated, but it’s not simplistic either.” He also applauds Pennie and Charles’ confident brief. “Lots of people today don’t see why they should change their way of life massively because they are growing older,” he says.